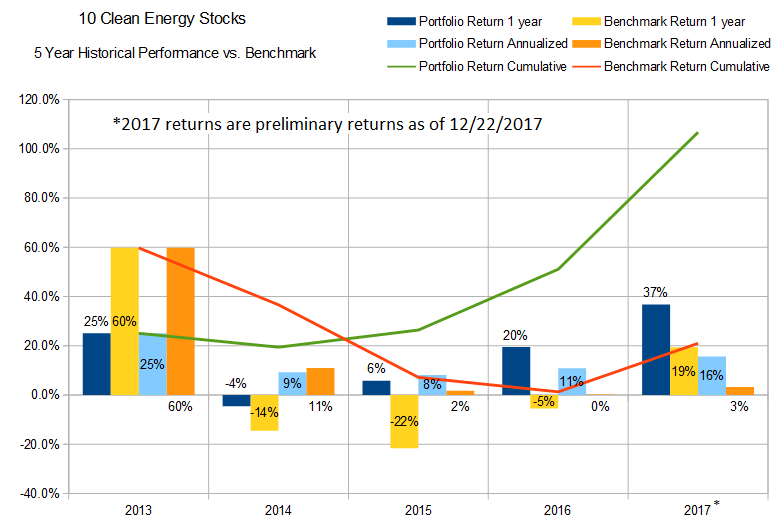 Annual total return for 10 Clean Energy Stocks model portfolio compared to benchmark through 12/222017. 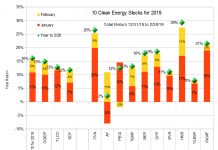 2017 is turning into a second banner year in a row for my “Ten Clean Energy Stocks” model portfolio. I expected at best to make high single digit returns after the impressive 20% (while my benchmark fell 4%). Instead, the portfolio produced a 36.8% total return while its benchmark is up 19.5% with only four trading days left in the year. Such returns are obviously cause for celebration, and also for profit taking. 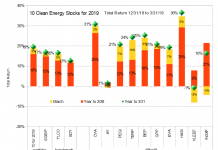 I plan to replace at least five of this year’s list with new stocks in the 2018 (tenth annual) “Clean Energy Stocks” model portfolio. 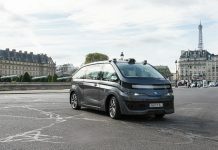 Two companies on the cusp are software-as-a-service vehicle and fleet management provider MiX Telematics Limited (NASD:MIXT) and energy-from-waste (EfW) operator and developer Covanta Holding Corp. (NYSE:CVA). I’m tempted to keep both of these stocks because they seem to be entering phases of long term growth. With MiX, the growth is the result of the company’s long term strategy of diversifying into new markets and emphasizing its bundled subscription offerings, which are finally taking off. The stock has taken off as well, more than doubling since the start of the year. Covanta has long been a low growth, high dividend company because of the high capital costs of developing new EfW plants. However, Covanta recently announced a new partnership with the Macquarie-owned Green Infrastructure Group which should allow Covanta to fund its next four projects in the UK without any new equity capital. In the week since the deal was announced, the stock has jumped 20%. While I’m still bullish about both these companies for the long term, if their stock prices continue to climb rapidly in the next week, the potential for further gains over the next year will be reduced. Since I build this list based on my estimate of expected return over the following year, I may decide to drop either from the list despite their longer term potential. On the other hand, leading Yieldco NextEra Energy Partners (NYSE:NEP), will be leaving the lists purely as a profit taking measure. Yieldcos are owners of clean energy infrastructure that use most of the cash flow produced by their assets to pay dividends to shareholders. When I added NEP to the 2017 list, I did so because I liked the current yield at 5.3%, even though I have long been skeptical of the faith many Yieldco investors seem to put in the company’s strong sponsor (NextEra Energy (NYSE:NEE).) I agree that having a strong sponsor is helpful, and have nothing against NEE in particular, but I’m not comfortable owning Yieldcos when their valuation is heavily dependent on achieving long term, double-digit dividend growth. That is the case for NEP today, now that stock appreciation of approximately 65% over the last year has reduced the current yield to 3.8%. NEP had already reached its current stock price of $41 to $42 by the end of August, when I wrote in my regular update, “As long as investors are willing to buy more shares at its current yield of below 4%, NEP should be able to maintain its target annual per share dividend growth of 12% to 15%. I personally prefer Yieldcos with higher current yields and lower growth prospects, and so have been taking profits on my position.” While there is no reason to think that other investors will not be willing to continue funding NEP’s growth at the current yield, I prefer not to invest on the assumption that they will. Perhaps my worst call over the course of the year was my decision to sell aerogel insulation manufacturer Aspen Aerogels (NYSE:ASPN) after a weak first quarter which looked likely to be followed by weak second quarter performance as well. I sold in the expectation that second or third quarter earnings would drive the already cheap stock down further, and I would be able to get back in at a lower price than I sold. As it turned out, I sold near the bottom at a small loss, and the stock is now up over 20% from my selling price, and up 18% from the start of the year. I will be dropping Aspen from the list partly because this year’s bad call is yet one more piece of proof that I’m much worse at predicting the performance of growth stocks like Aspen than I am with the income stocks I tend to focus on. 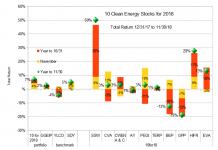 Over the last decade of Ten Clean Energy Stocks model portfolios, all of my biggest losers have been growth stocks. Although readers who sold when I did likely only lost a couple of percent, and readers who held on for the entire year saw a 20% gain, I’ve decided that it’s time to stop trying to pick growth stocks. I will not be picking any new growth stocks at all in 2018, although, as I noted above, I may decide to keep MiX Telematics in the list. Finally, regular readers will not be surprised that I will be dropping 8point3 Energy Partners (NASD:CAFD). Although the Yieldco is has a current yield of 7.5%, I believe its dividend is unsustainable, for two reasons. First, while most other Yieldcos finance themselves mostly with amortizing, non-recourse debt at the project level, 8point3 uses interest-only debt at the company level. All of 8point3’s current debt will come due in 2020, and rising interest rates mean that the Yieldco will have to refinance at a higher interest rate, and may in fact have trouble finding lenders willing to lend without some return of capital. Higher interest rates and possibly having to begin making principal payments will both reduce 8point3’s Cash Available For Distribution, also called CAFD. Since the company is currently paying nearly all its CAFD out as dividends, a drop in CAFD from refinancing will force the Yieldco to cut its dividend. Since 8point3’s sponsors, SunPower (SPWR) and First Solar (FSLR), are looking for a buyer for their stakes, some shareholders are doubtless hoping that a deep pocketed white knight will bail them out. I think this is unlikely given 8point3’s current valuation. First of all, I believe that 8point3 is very aggressive in how it defines CAFD (not all Yieldcos use the same definition.) Second, even if we accept 8point3’s CAFD number, any buyer will be comparing 8point3’s valuation to similar possible investments. Since 8point3’s assets consist entirely of solar, it makes sense to compare the Yieldco to a solar farm for the purposes of valuation. Existing solar farms usually sell at 7% to 8% current yields, making 8point3’s stock slightly overvalued in comparison. In short, I think 8point3 is overvalued with an unsustainable dividend. I find myself shocked at how well my model portfolio has performed this year. Part of that is good (or lucky) stock picking and timing, and part is the strong performance of the stock market as a whole in 2017. The real-money Green Global Equity Income Portfolio which I manage has also had a good year, up 22.5%. 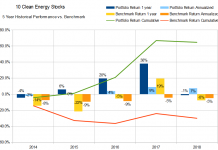 It’s relatively weak performance compared to the model portfolio is largely due to holding a fair amount of cash and less concentrated holdings in this year’s big winners, MIXT and (especially) NEP. All in all, I can’t complain. I’ll be happy to do half so well in 2018. Stay tuned for 10 Clean Energy Stocks for 2018 on New Year’s Day, or see here if you’d like a sneak peak. Disclosure: Long MIXT, CVA. Short Puts on NEP and FSLR [net long position], Short Calls on CAFD [net short position].